Delivering Las Vegas To You!!! We like to treat our Clients with a personal touch, taking care of your event and making it worry free for you is our main goal. 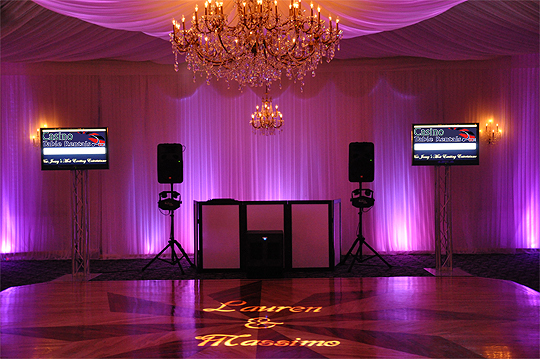 We use state of the Art DJ equipment, professional lighting and setup. You won't see cables laying around or unprofessional settings. We play a variety of dance music that will appeal to all age groups. Our Extended Music library consists of music from the 1920, 30's, 40's, 50's, 60's, 70's, 80's, Hip Hop, Reggae, R&B, Disco Music, Club Dance, Techno, Pop, and Spanish ( Salsa, Merengue, Cumbia, Bachata, Boleros, etc...). We set up before your first guests are expected to arrive. Comfortable volume levels that permit conversation or if you want loud music we can provide that as well. Our professional D.J. 's are qualified Masters of Ceremony and are verse in both languages (Spanish and English). We coordinate with you ahead of time in order to help make your event all that you dreamed it would be and more! We provide you with a Planning Guide so that you can select songs for the evening in advance. We offer you a reliable, affordable, experienced and personalized service, and we are dedicated to making your event all that you have always dreamed of. NOBODY has what we have in MIAMI, GUARANTEED! We Will Even Price Match! CLICK HERE FOR DETAILS!